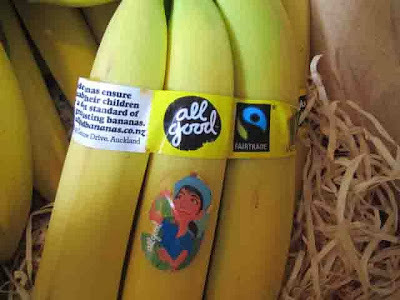 Here's my first recipe for the All Good Family Sticker competition. It was a great way to start the day! 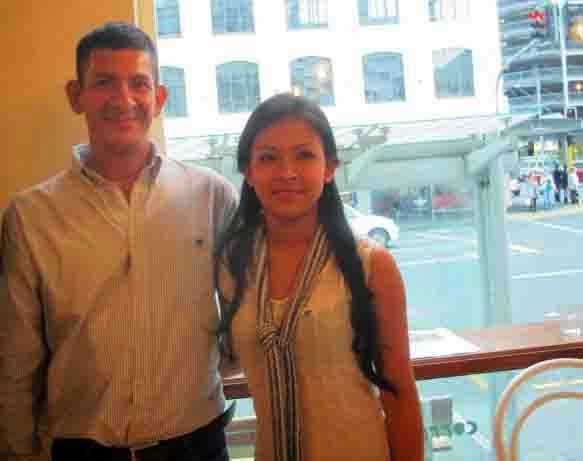 This one is for Kelly, Wilson's lovely daughter who is able to study civil engineering at the University of Machala thanks to the fair price her family receives for growing Fair Trade bananas. It was inspiring to hear Wilson (a Fair Trade Banana Farmer who supplies All Good Bananas) and Kelly speak at the Shaky Isles Café last night , to find out just how much effort goes into producing their bananas and how much Fair Trade has added to their quality of life. 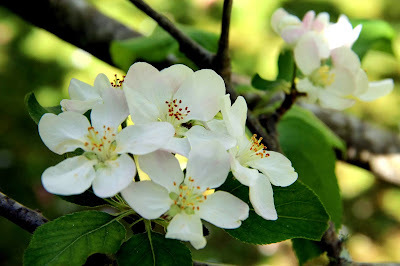 The apple blossom tree and puff balls are out in our garden. A new beginning. 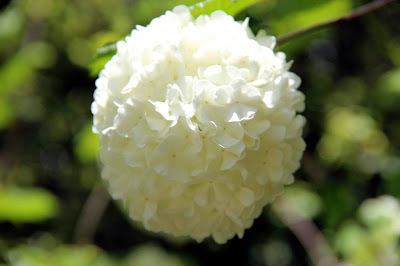 First pics with my DSLR camera. When I dropped into Milly’s kitchenware shop on Ponsonby road last week Kirsten was making Halloween cookies in their demonstration kitchen. 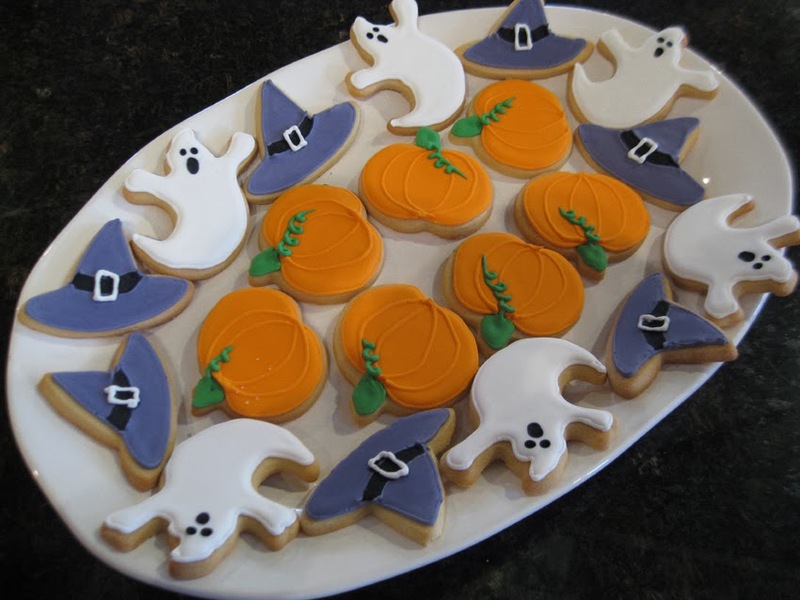 It was fascinating to see how effortlessly she first outlined the pumpkin shaped cookies and then flooded the inside with brightly coloured orange icing. Lastly, in a few confident strokes, she added green stalks attached to curly vines. It all looked deceptively simple, but you would have to put in some practice to reach her level of perfection. She encouraged me to give it a try and was more than happy to explain everything in detail. And there’s time, as Halloween is still a couple of weeks away. In the middle of Millys there was a great Halloween display. I especially liked the creepy little sugar bats and spiders, the cookie cutters for cats, ghosts and pumpkins, and the molds for skulls and eyeballs! Enough to send shivers down anyone’s spines! On October 31 there will be quite a few kids in our neighbourhood getting dressed up in costumes and knocking on people’s doors playing tricks and treats, and hoping for sweets. So what’s it all about? Although it is a secular festival today, Halloween has its roots in the ancient Celtic Festival of Samhain and later became associated with the Christian holy day of All Saints. Irish immigrants took the festival with them to America where they went to make a new life for themselves after the Great Famine of 1846. The festival did not take off in a big way in the USA until the early 20th century. American kids first began to get into costumes and going from door to door to Trick or Treat in the 1920’s. It’s a bit of a puzzle why our Irish and Scottish immigrants did not bring this festival with them during colonial times but it’s well and truly here now! There are parents and kids who love to party at Halloween. They can’t wait to get into their costumes, to trick and treat and thoroughly enjoy the occasion. Others decry New Zealanders joining in a festival which has become highly commercialised in America. People there will spend between 5 and 6 billion on Halloween this year, which is a huge amount of money, especially during a recession. There’s also the safety factor. Crossing roads in the dark can be a hazard and letting kids go unaccompanied poses further risks, so hopefully parents will go with their kids. At Milly’s they suggest a neighbourhood party as a safer way for children to enjoy Halloween. It’s also a great way to get to know the people in our neighbourhood. We plan to keep Halloween simple this year. I’ll put a big pot of pumpkin soup on the stove, and make toasted cheese sandwiches to go alongside. And some of Kirsten’s special Halloween biscuits would be a special after dinner treat. Then, when it’s dark we can light a candle in a carved Jack-o-lantern and retell the Irish legend of Stingy Jack. He got up the devil’s nose for trapping him in a tree and carving a cross into the trunk. The devil’s revenge was to make Jack forever wander the earth at night carrying only a lantern to light his way. Wrap in glad wrap and chill for ½ hour. Roll out on floured bench to about ¼ inch thick. For chocolate cookies substitute ¼ cup cocoa powder for ¼ cup flour. You could also add lemon zest, spices or chocolate chips. The royal icing was made using Wilton Color Flow. Wilton Color Flow is pasteurised egg white with an added whipping agent. It is really good for making royal icing as the recipe stays the same each time you use it. You also don’t have the worry of bad egg whites. Make sure all of your utensils are thoroughly cleaned before you start. Any traces of fat will affect the icing. 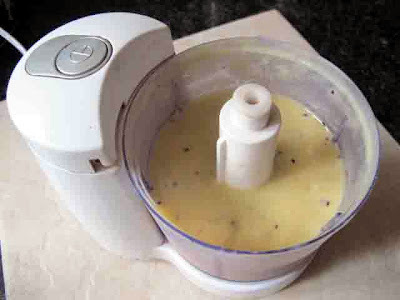 Using an electric mixer and flat paddle, blend all ingredients on low speed for 7 minutes. If using a hand-held mixer, you may need to use a higher speed. When your icing is finished it should look a lot like meringue. Color flow icing “crusts” quickly, so keep it covered with a damp cloth while using. Wilton decorating Tip 3 for outlining the cookie. Piping bag – I use parchment bags as they can be cut in half to make smaller bags - cost effective. You have more control with less icing helping to outline easier. Put the tip 3 into the end of your piping bag. Add icing. Squeeze the piping bag as you move around the cookie. Outline all cookies. Thin icing down by adding a little water, until a drop of icing merges in on its self by the count of ten. Spoon this thinned down icing into a new piping bag (no Tip needed in the bag). Snip the end of the bag and gently squeeze while moving the bag back and forth to flood the inside of the outline. To add contrast colour – use thinned colour and drop into wet icing for a smooth finish. Leave the cookies for several hours or until the icing is dry and hard. These are a great gift idea. Package cookies in the cellophane bag with a twist tie. I first wrote this when was the resident TV3 website Foodie several years ago and thought it was worth sharing again. 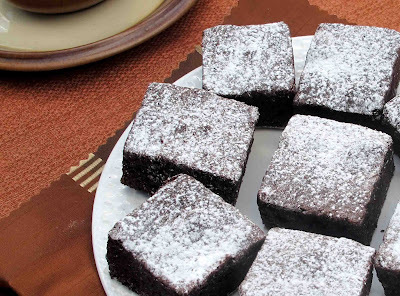 Cocoa is used rather than chocolate to make these delicious brownies. I created them to inspire readers of the Breeze radio website ( to which I contribute a weekly recipe) to enter The Big Fair Bake, a competition to encourage cooks to use Fair Trade products which helps to give farmers and their families in some of the poorest countries in the world a Fair Go. Take off the heat and beat in the eggs one at a time. A thorough beating will result in a lighter brownie. Sieve the cocoa, add the salt and mix these in well. Sift the flour and baking powder and mix in gently . I use my silicone spatula for this. At this point you can add a handful of dark and white chocolate chips and/ or freeze dried raspberries if you wish although these brownies are good plain as well. Line a 20-23 cm tin with baking paper and pour the brownie mixture in. Bake for 20-25 minutes at 180 degrees C until the centre is slightly firm to the touch. Don’t overbake. Brownies should have a fudgy texture. Let then cool in the pan, before dredging with icing sugar and cutting. My kimchi is ready a little earlier than I thought it would be. My Korean hairdresser suggested that 5 days would be enough, even shorter in summer. Then pop it into the fridge. 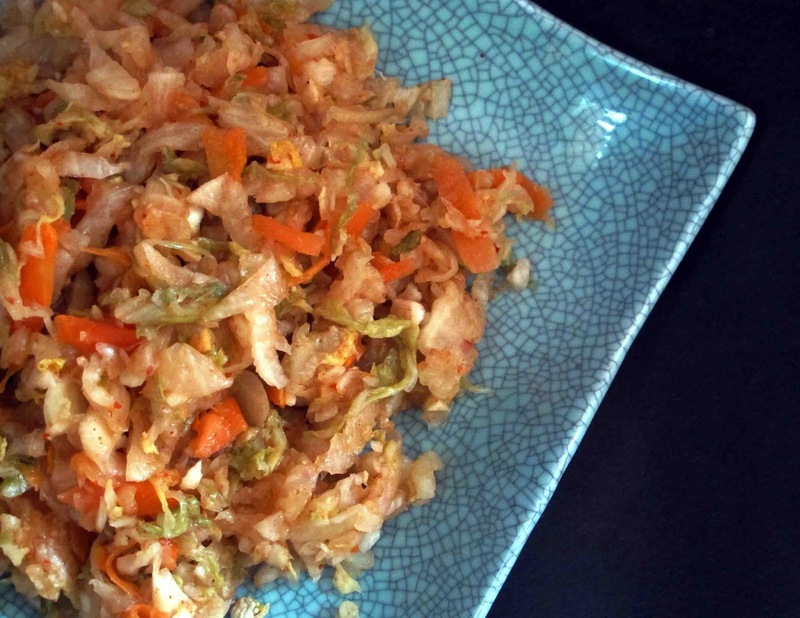 She makes kimchi at home all the time and eats it every day. She also said that a turnip would have been good to add . I detest turnips so I'm glad that it was too late to take up her suggestion. And if you do add fish sauce it should be Korean she said. But she couldn't really explain the difference. There is a dish which she suggested I make with it. As her English is poor, and my Korean nonexistent I'm not sure I got the gist of it, but it seemed to be made by mixing kimchi with rice and then frying it. If anyone has tried this I'd love to hear about it. In the meantime I'm just going to do what Jo Nolan who kindly taught us to make her kimchi recipe ( see a previous post) suggested. Her advice "Start by eating a spoonful every day and build up the quantity gradually ." Here isa link to my previous post on kimchi. I acquired Marcella Hazan's Classic Italian Cookbook in the 1970's. Up until then my " Italian" cooking was limited to cooking spaghetti bolognaise, pizzas and meatballs. So what did she teach me about Italian cooking? She started by dispelling the myth that there is such a creature as "Italian Cooking,"
as it varies from region to region.
" Eating in Italy," she said is sustained by a life measured in nature's rhythms, a life that falls in with the slow turning of the seasons, a life in which, until very recently, produce and fish reached the table not many hours after having been taken from the soil or the sea"
For her Eating Italian food was inexorably linked to family life and was a multi-layered experience. "There probably , has been no influence , not even religion, so effective in creating a rich family life, in maintaining a civilised link between the generations, as this daily sharing of a common joy." Marcella shared a wealth of authentic Italian recipes which she explained very clearly using ingredients which were readily available in the States where she lived, and for us in New Zealand as well. Time passed and I rather neglected Marcella as I explored food from different countries until I acquired her Essentials of Classic Italian Cooking (1992). This large book was based on her two earlier recipe books but also included an entirely new chapter on fundamentals. I began to get excited about her recipes again. This book will I am sure, remain as a timeless reference to Italian cooking which our children and grandchildren will continue to learn from. For the last couple of years I had the privilege of being Marcella Hazan's Facebook friend. The Marcella I came to know on Facebook was in her eighties and struggling with poor health but still very knowledgeable and eloquent. Food and the pleasure of sharing it with family remained a central part of her life. Throughout the world on October 26, 2013, Marcella fans from all over the world have been encouraged to cook a recipe or meal from one of her books. As it is the season for locally grown asparagus I chose her Gratineed Asparagus with Parmesan to serve as part of a three generation family meal . We lingered over it on the deck outside in the early evening while the tuis swooped through the trees. I think Marcella would have approved. 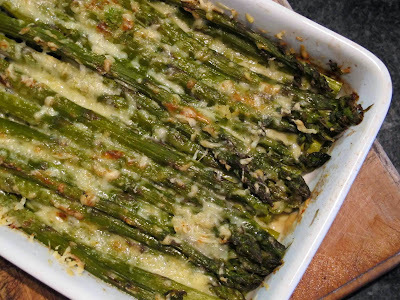 One of Spring's most exquisite gifts to the Italian table is young asparagus, first boiled then briefly baked with fragrant, grated and aged Parmesan cheese. Of all the many dishes called alla parmigiana this is an authentic speciality of Parma, which does not keep it from being a great favourite all over Italy, or even France, where ,curiously, it is called a la milanaise. Trim and Boil the asparagus. Smear the bottom of a rectangular or oval baking dish with butter. 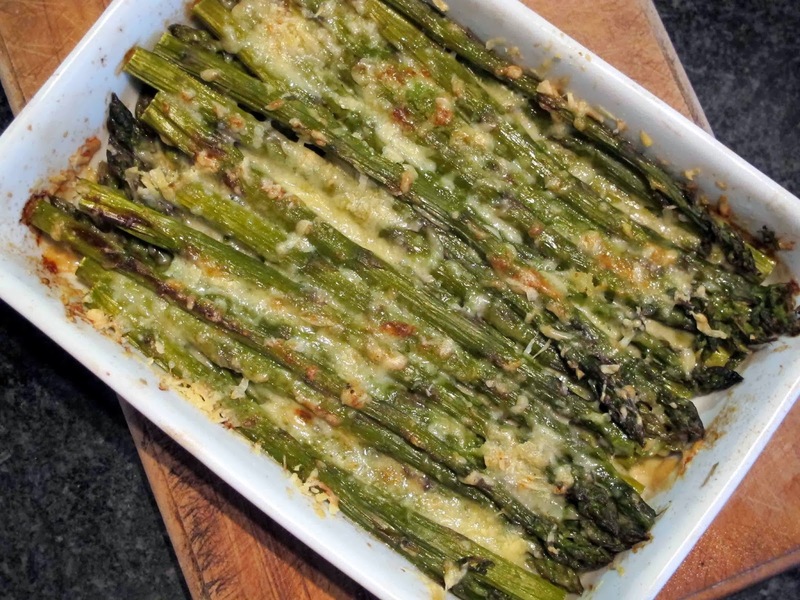 Place the drained , boiled asparagus in the dish, laying them down side by side in stacked rows, with all the buds in each row pointing in the same direction. The tips of the spears in the upper row should be resting on the ends of the stalks below. Sprinkle each row with salt and grated cheese and dot with butter before laying another row on top of it. Bake on the uppermost shelf of the preheated oven until a light golden crust forms on top. After taking it out of the oven, allow to settle for a few minutes before serving.